When do bits of fabric become a quilt? Someone at my work asked about the quilts that I make and made the mistake of asking me to bring one of them in. 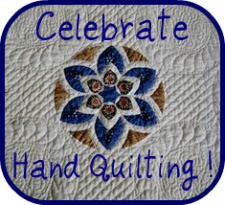 I do still get some ribbing from the guys that I work with for being as passionate about quilting as I am. I take it in stride though, and sometimes it still does get to me. Luckily my passion outweighs any reservations I have about spending my time with this wonderful art form. Waking up early, I prepared for my day… made coffee, packed my lunch and, oh yeah… remembered to take my perfectly folded quilt with me to show off at work. It was a little of a let-down when I found out that the person I was supposed to show the quilt to was off-site all day due to some issues that he had to deal with. On second thought though, this would give me a reason to take it back with me the next day. As I was walking back to the car I realized that what I had under my arm was no longer bits of thread and fabric. I could feel the weight of it and even the feel of it had changed from when I was sewing the fabric together. As I took the quilt home I wondered what it would feel like when I finally washed it. This wasn’t the most complicated pattern and if you’ve followed my posts at all, you’ll know that it is one of five that I made in nine days. It has become mine though, unlike any of the other quilts that I’ve made and that’s saying a lot. I want to say a special thanks to Linda my quilter, the person who did such a wonderful job quilting these bits of fabric into such a resplendent quilt. While talking to my daughter Samantha who I’ve convinced to pick up this passion, I mentioned that I hadn’t come up with a name for my quilt yet. She reminded me of a time when she was only six years old and had come home to find a doll that I had bought for her. The doll was made out of fabric and dressed in blue and white pajamas, had yellow yarn for hair, and big blue eyes. You should have seen her face when she saw the doll, she said “she looks like me!” I told her that the doll’s name was Sally from a bedtime story that my father had told to me. 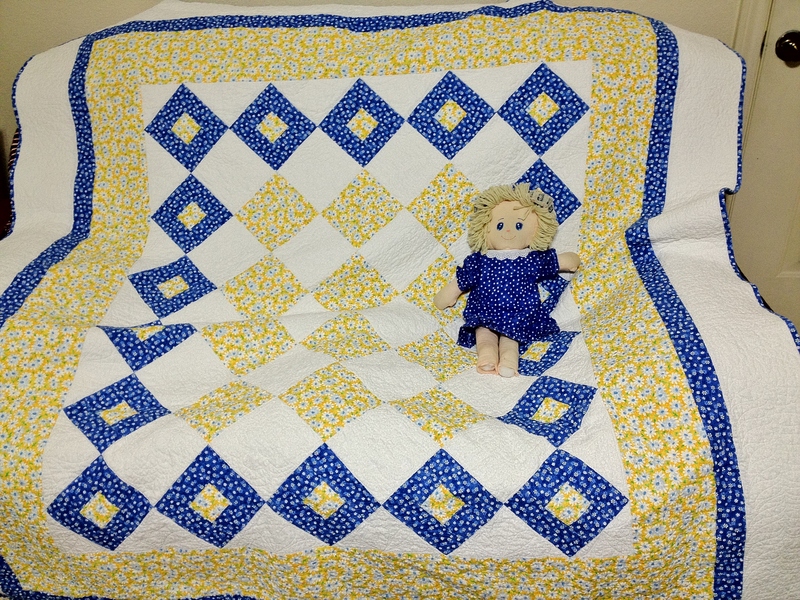 This quilt, my daughter told me is like the doll you gave me and should be called the ‘Sally doll quilt’. Yes… it’s the middle of summer but as I sit here writing this and it’s still over 95 degrees, I am wrapped up in my quilt and still I wonder… when did these bits of fabric become a quilt? The minute it made the connection to my heart through my memories. It will always and forever remind me of that day of happiness with my daughter.